Once again the list could go on for page after page, but there are always a few tips and ideas that are more commonly needed when you want to do any touching up or painting repairs in your property. Often the problem comes from knowing that no painter will come out just to do an hour's work, or even for just half a day. As a consequence, without any real knowledge, nothing gets done and after a while the whole standard of decor in your home will just deteriorate as you 'put up' with a number of imperfections and marks. Doing a bit of general maintenance, as you would when you service your car, can pay big dividends in the long run. If you are buying a brand new property, ask the selling company to leave half a tin of emulsion behind so that you can touch up the walls after you move in – no property escapes marks on the walls when furniture is moved in and out of rooms. Don't let them fob you off with saying "It's all magnolia or gardenia" as that colour changes depending on the brand and believe it or not, can alter fractionally in shade with each batch the same manufacturer produces. Also go to page interior and exterior painting. At one time or another you are bound to have water damage to a wall or ceiling. This will usually leave a brown ring or stain at the edge, which is a mixture of elements including some oil-based content from timber. Simply painting over the stain with emulsion will not cure the stain and it will just reappear through the new paintwork. A simple trick is just to apply two thin coats of oil-based undercoat over the whole stained area and then paint over it with emulsion. The oil-based undercoat will act as a barrier to the discolouration. Alternatively, though more expensive, you can buy spray-on 'stain block' which has the same effect. Also have a look at the different types of paint. Cracks will always appear throughout the life of a property. Often they can just be annoying hairline cracks that somehow you just don't seem to be able to get rid of. The trick is to use a Stanley knife or similar boxcutting knife and cut out the crack from both sides in a 'V' that creates a proper gap to be filled. Don't go berserk, but 2-3 mm deep is enough. Then use a lightweight filler – not Polifilla – Polycell, one called 'Onefill'. This is a filler made of minute glass beads and comes ready mixed in a tub – just stir up a small portion to aerate it and then apply to the crack with a flat blade. After three hours the filler should be dry and you simply need to sand it down with a fine grade sanding sponge which will leave a perfectly flat surface with less than twenty seconds of sanding – unlike the old-fashioned Polyfilla. Then just cover the area with two coats of paint – one coat will seal the filler but leave a matt finish, so the second coat is important. 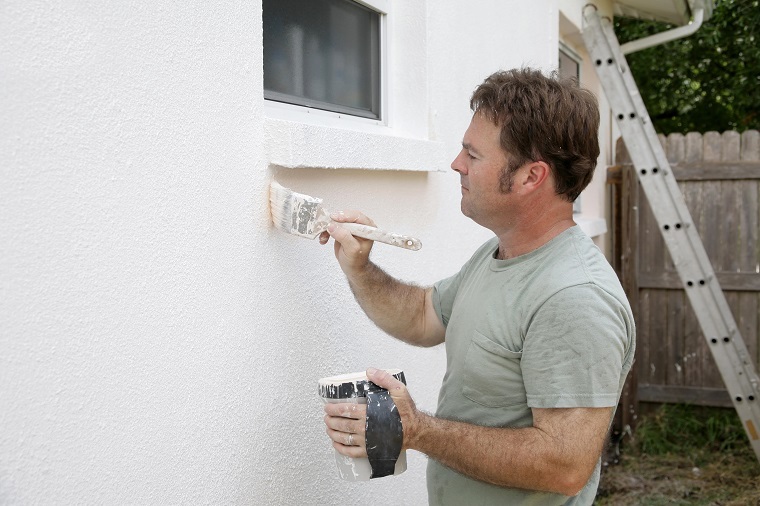 The best way to paint wall repairs and marks is with a mini roller to get the same finish. 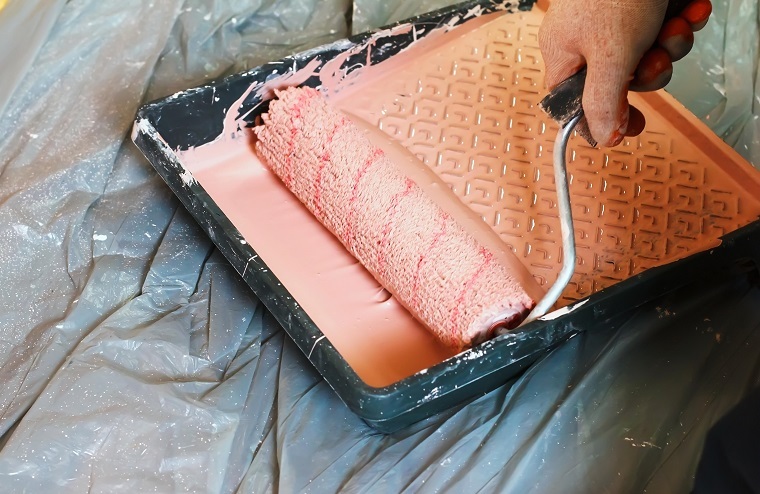 Most walls today are painted with rollers, not brushes, so if you touch up paintwork with a brush it will leave marks. On the following page you will find more information on painting materials. Often gaps will appear between skirting boards and walls and also around door frames and the wall. To fill these gaps, buy a tube of 'decorators caulk' and a caulking gun – the gun costs about £5.00 and the caulk about £2.00. The gun is used to squeeze the caulk out of the tube through a fine nozzle which you run along the gap. The caulk is then smoothed off using a wet finger (very technical!). After a day the caulk is ready to be painted over as if you don't, it will trap dirt and dust and start to discolour. Nowadays kitchens and bathrooms are usually painted with vinyl matt paint rather than the shiny vinyl silk paint. Particularly in kitchens and around the cooker, you may notice small round oil patches that look just like slightly darker paint. Like water stain, if you just emulsion over these marks, they will leech through the new paint and reappear. Using two thin coats of undercoat or a proprietary stain block before painting the areas with emulsion again will solve this problem. Find more information on vinyl paints and other types of paint.